Pedestrian-motorist accidents occur in communities throughout Ontario and when they do, the pedestrian often suffers severe or fatal injuries. No one is immune from these accidents; pedestrians of all ages are hurt in collisions with motor vehicles. In Canada, the onus is on drivers to take care with regards to pedestrians who are far more vulnerable to injury than anyone in a motor vehicle. Pedestrians who were seriously injured by a car or truck can receive accident compensation for their injuries; as can family members who lost a loved one due to a pedestrian-motorist collision. Talk to an experienced pedestrian accident ILO lawyer in your community for more information on how you can get compensation if you were injured. The Office of the Chief Coroner of Ontario recently completed an extensive review of pedestrian deaths in Ontario over a one year period. In this document, Toronto’s Medical Officer of Health warned that 50 per cent of adults are not exercising enough to maintain their health, which is one of the many reasons why Ontario needs to ensure that walking and cycling are encouraged and most importantly, safe for everyone. This study found that for one third of the pedestrian fatalities that occurred, the pedestrian’s actions contributed to or resulted in their death, which means that in about two thirds of pedestrian accidents, a driver likely did not take proper care to avoid striking the pedestrian. In many of the fatalities, the driver actually committed a traffic violation just prior to the collision with the pedestrian. This study concluded overwhelmingly, that pedestrian deaths are preventable and changes in behaviour, for drivers and pedestrians, are needed to reduce or eliminate these devastating events. The Chief Coroner’s report identified common factors in pedestrian-motorist deaths, as follows. Driver’s failure to yield – Drivers sometimes strike pedestrians while turning left, right, going straight or at crosswalks, when the pedestrian should have been given the right of way. Vehicle speed – Even when the motorist is not necessarily speeding, pedestrian-motorist accidents are more likely to occur and to result in death on streets with higher speed limits. Pedestrian distractions – Pedestrians talking on cell phones, listening to music, riding a skateboard, and so on, are a factor in many deaths. Pedestrian crossing at mid-block – Although this is often not a safe choice, drivers must be observant and prepared for a pedestrian to cross and stop in time, if at all possible. Driver inattention/distraction – Pedestrians are sometimes struck while walking on the sidewalk or shoulder of the road, demonstrating that the driver lost control of their vehicle. Such accidents often occur when a driver takes their eyes and attention off the road. Alcohol and/or drugs in drivers or pedestrians – Intoxication in pedestrians or drivers is a factor in pedestrian deaths, particularly when the pedestrian is impaired. Male drivers – Although the registered drivers who are male and female in Ontario are fairly equal in numbers, drivers who fatally injured pedestrians were males in 70 per cent of the cases examined. Senior citizens – People over 65 represent about 13 per cent of the population, but they account for 36 per cent of the pedestrian deaths. American studies have had similar findings. When someone is fatally injured in a pedestrian-motorist accident, the most common cause of death is a catastrophic injury to the head or brain. The Ontario Ministry of Transportation offers several tips for pedestrian safety. In particular, pedestrians are urged to always check for motorists before crossing and to cross only at intersections, whenever possible. Pedestrians are also safer when they keep distractions to a minimum when crossing a road. Distractions may include talking or texting on the phone and listening to loud music. The old adage, ‘walk/don’t run across the street’ is still true, not only due to the added risk of falling when we run, but also because a driver may not have enough time to stop for someone unexpectedly darting or running across the road. Pedestrians who do not respect these ‘rules of the road’ may be found to have contributed to their own injuries, in the event of a pedestrian-motorist accident. The key recommendations for motorists are to keep a good lookout for pedestrians, particularly before turning at intersections and in areas where pedestrians are more likely to be walking. Drivers need to maintain a speed that is appropriate for the road conditions, so that they are able to stop in time at crosswalks, bus stops and community areas where children and other pedestrians may unexpectedly cross. Motorists also need to keep their windows clean and free of obstructions. It is generally important that drivers are always attentive to their surroundings and to other road users. Drivers who are lacking in any of these practices may be found ‘at fault’ if a pedestrian collision occurs. Who is liable in a pedestrian-motorist accident? The Ontario Highway Traffic Act under section 144 defines laws pertaining to pedestrian right of way. Drivers turning right or left at an intersection must yield the right of way to pedestrians approaching to lawfully cross. Drivers entering a road from a private driveway or private road must yield the right of way to pedestrians on the sidewalk. At a pedestrian crossover, if a pedestrian is crossing the driver is obligated to stop and not continue driving until the pedestrian has fully crossed. Drivers cannot pass other vehicles within 30 meters of a pedestrian crossover. Pedestrians have the right of way at any intersection where the traffic light indicates ‘walk’ or a circular green indicator. Pedestrians who lawfully began crossing a road continue to have the right of way even if the indicator changes before they finished crossing. Pedestrians should NOT cross at a traffic control signal if the lights are amber, red, ‘don’t walk’ or advanced green for turning vehicles. If you are asked whether pedestrians always have the right of way, the answer is ‘yes’ when they are obeying the law. However, even when pedestrians cross at mid-block or other locations where there is no official crosswalk, the onus is on drivers to pay attention and take due care. In many of the circumstances that result in pedestrian-motorist collisions, a seriously injured pedestrian or family of a fatally injured person are likely to have a case for compensation from the ‘at fault’ driver. A 61 year old pedestrian was crossing Speedvale Avenue in Guelph when she was hit by a BMW turning left onto Speedvale. The victim was taken to Guelph hospital where she was treated for non-life-threatening injuries. The BMW driver was charged with failing to yield to a pedestrian. A young person in their 20’s was struck by a car on Carling Avenue near the Lincoln Fields transit station in Ottawa and sustained serious head and facial injuries. An 18 year old Western University student was fatally injured by a car while she was walking on the sidewalk along Lambton Drive in London. The 24 year old driver of the car that spun out of control, hopped the curb and struck her is facing a charge of impaired driving. The victim suffered a broken tibia and was listed in critical condition at a London Hospital. A 20 year old pedestrian was attempting to cross Islington Avenue in Toronto, when he was struck by a Ford Explorer, then thrown into the path of a Nissan Sentra. He suffered fatal injuries at the scene. If you were seriously injured by a motorist, you can make a claim for 'no fault' accident benefits under your automobile insurance policy or under the policy of the driver involved in the accident. If a driver was negligent in causing your accident, you can also sue the driver and his/her insurer for damages. ‘Damages’ refers to the monetary sum that is needed to return an accident victim to the condition they were in before the accident occurred. If you wish to make a claim for accident disability benefits from your (or the driver’s) insurance company, you need to contact your insurer within 7 days of the accident, or as soon as possible. Be prepared to answer questions about the facts of your accident, names and licence numbers for the involved driver(s), and other relevant details. Your insurance company will provide an Application for Accident Benefits form that needs to be completed and returned to them within 30 days. The benefits to which you may be entitled are governed under Ontario’s Insurance Act Statutory Accident Benefits Schedule (SABS), and you are eligible for these benefits regardless who was negligent in the accident. 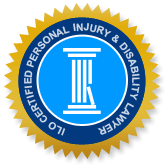 The Injury Lawyers of Ontario (ILO) accident lawyers specialize in personal injury law pertaining to negligence actions and accident benefits claims. Our lawyers have successfully represented many clients who were injured in motor vehicle accidents, as pedestrians, cyclists or injured motorists. We can best advise you on your rights with respect to the accident benefits to which you are entitled, and can act as your representative if your claims are denied or stalled by your insurer. Call your local ILO law office today to speak with an empathetic lawyer who will stand up for your rights.